Pennsylvania residents may soon face a crisis in health care, if the state courts repeal a rule which helped stave off a similar situation more than a decade ago, when physicians left their practices, moved to other states or retired early due to skyrocketing insurance premiums. Repealing the rule could lead to patients having to say goodbye to their physicians or patients having to drive farther for care. Additionally, recruiting physicians and specialists would be difficult, and medical innovations may be halted. Overall, patient care would suffer and everyone would face higher health care costs. The House Majority Policy Committee recently hosted a forum to examine the issue and hear from numerous stakeholders about the negative impact this rule repeal could cause. To learn more about the issue, click here. Did you know the York County School of Technology is the oldest on-going career and technical school in the United States? It is also a great example of how students can prepare for jobs straight out of high school. 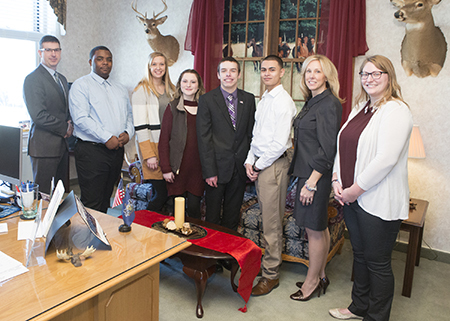 It was my pleasure meeting with some of the school's students and advisers yesterday in Harrisburg. I learned a great deal of how our students of today are preparing for the workforce of tomorrow. Tomorrow, Tuesday, Feb. 5, Gov. Tom Wolf will unveil his budget proposal for fiscal year 2019-20. I am curious to hear what the governor will proposal. I will review the details in the coming weeks and the Appropriations Committee will begin its series of hearings on the proposal on Feb. 11. Keep your eyes on my social media for updates and reactions. While Pennsylvania has protection for victims written into its laws, a constitutional amendment is the only way to ensure victims have equal footing with offenders and the only way to ensure the victims have some kind of redress when their rights are violated. Eligible Pennsylvania residents who wish to obtain a REAL ID should begin the pre-verification process now. Customers who want to obtain a REAL ID need to bring the required documents to a Driver License Center so they can be verified in person. Find a Driver License Center near you by clicking here. PennDOT staff will scan the documents to the customer’s record, and when REAL IDs are available in March, the customer can opt into the program online, and their REAL ID will be sent through the mail. REAL ID is optional for Pennsylvania residents. There is no requirement for any resident obtain a REAL ID and PennDOT will continue to offer standard-issue driver’s licenses and photo IDs. However, a federally accepted form of identification must be used as identification to board a commercial flight or visit a secure federal building starting Oct. 1, 2020. A Pennsylvania REAL ID will fulfill this requirement as will a U.S. Passport. For additional information, please call my office at (717) 432-0792.